Taking you step by doable step through the arthritis healing process. I’m sorry, only members have access to this page. 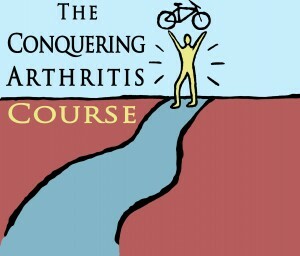 We’d love to have you as a member of the Conquering Arthritis Course. Check out the course syllabus to see how what you will learn can help you heal your own arthritis. To become a member visit the link below. In Sept 2011 I was diagnosed with psoriatic arthritis. In two months I had gone from a very active, physical athlete to walking with a significant limp. All sports activities came to a halt. I also have four children (under 9) that I was having trouble keeping up with. I was reluctant to get up and walk to the kitchen due to the pain I felt in my ankles and feet.